Shrooms High: How Long Does a Shrooms Trip Last? A person can expect a shrooms trip to last anywhere from three to six hours. Some species of mushrooms contain a higher concentration of psilocybin than others. Due to the differences in psilocybin content between particular types of mushrooms, 4 grams of one type of mushroom may have the same effect on a person as 0.5 grams of another kind. Some of the methods used to dry and store hallucinogenic mushrooms preserve psilocybin better than others. 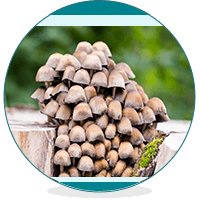 For example, using a dehydrator or another kind of moisture-removal product can help the mushrooms to retain more of their potency than if they were simply fan-dried. Shrooms can be eaten by themselves, whole; sprinkled onto or mixed in with food; or crushed into a powder to be placed inside of a capsule, made into a tablet or other solution. How Long Does it Take to Start Feeling the Effects of a Shrooms High? For most, the drug’s effects will become apparent within 20-40 minutes of ingestion. However, Depending on variables such as the kind of mushrooms you use and how you ingested it, psilocybin mushrooms can take anywhere from 20 minutes to 2 hours to take effect. How Long Does a Shrooms Trip Last? On average, a single dose of shrooms will produce a trip that lasts somewhere between 3 and 6 hours. Of course, a trip can vary depending on a number of factors. A person will not automatically trip if he or she does shrooms. If the user ingests only a small dose of shrooms, they may simply experience a sense of relaxation, feelings of euphoria, and some noticeable changes in the way that person perceives colors or sounds. In cases where the person has ingested far more than the recommended dose for that species of mushroom, his or her trip may last longer. What Happens During a Shrooms High? As stated above, doing shrooms does not always guarantee that someone will trip. While some trips can be enlightening experiences, a bad trip can cause feelings of fear, panic, anxiety, and other intense, negative emotions. Addiction Resource » Addictive Substances: The Anatomy of Drug Addiction » Shrooms – What are They? What are Their Side Effects? » Shrooms High: How Long Does a Shrooms Trip Last? How do I find a magic mushroom ? Be careful not to confuse Magic Mushrooms with Protostropharia semiglobata, a very similar mushroom but is inedible. Psilosybin Semilanceata will rarely grow directly on feces but may be nearby or in animal enclosures. I picked sum yesterday. Use google go find out how. I would pick ’em since that’s cheaper than Buying em from the drug dealer. why not? they are just trying to help you feed your addictions. Tripping currently and very helpful read. Relaxing. Thank you. I’m going through a horrible trip right now but that’s cause I think I took way more than any human is suppose to and I feel as if I’m about to puke all the time and that sensation of wanting to puke has been here the whole trip which has been like 5 hours now. Please take the amount you are suppose to and I hope no one ever goes through what I’m going through. It has to end eventually, right? Can’t help wondering how much you had. This is for all the Rf ‘s out there , this is not like any other ‘drug’ , each shroom has different amounts of the key ingredient that gives the trip factor. So it’s the unmeasured amounts that turn out to be fatal. There are people out there living with that trip day and night. It’s flipped their brain and they are unable to come down or come back. These are people that live on the fringes or in communes or who knows where, away from the human race. Thank you for sharing your insights about the other side of the magical mushroom. This is very educational. Shrooms give amazing trips, and can give you information about yourself that you may not be able to find in your day to day life. However while being an amazing experience can be dangerous and you should only pick shrooms if you know exactly what you’re looking for as there are many species that look incredibly similar. Grassland and fields that have had cows or sheep there within the last decade. I would not recomend any mushrooms that grow around tree stumps as they can be very easily confused other types such as Pholiatina Rugosa – a deadly poisonous mushroom. wish me luck, im going to try shrooms, any comments before i do?